In this internet world, online business is growing every day and peoples are seeing reviews on the internet before buying the products. Online review business is one of the most successful businesses in the current era. Nearly 80% percent of peoples are buying products after seeing the review in the online websites. So Phpscriptsmall developed online video review website with latest features and technology. The Entrepreneurs or individuals can make use of our Product Video Review Script and earn high revenue from the review website business. This review script is developed in a user-friendly manner, so the user can navigate and view the different reviews and give their feedback in a simple manner. 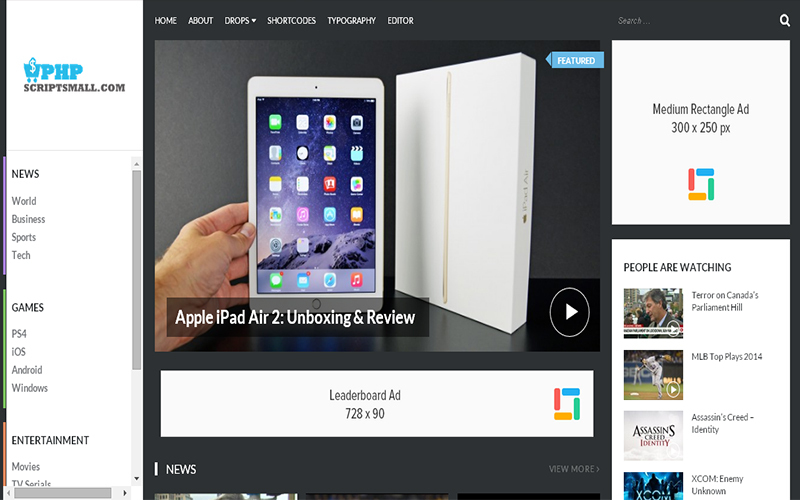 This Video Website Script PHP is mainly developed for all kind of products reviews such as gadgets, news, games, entertainment and more on. The user can search for videos by desired keywords and each video are categorized by various category. The user can view various videos with front view and title. Each video has the posting date and description. The visitor can watch the video and share the video with the social networks easily. After watching this user can give the comment and follow up the comments of videos by email. The important features of the Video Portal Script are an advanced search option, newsletter, posts, secure code, powerful admin dashboard, feedback management, comments, media, pages, posts, attractive user interface; simple uploads option for video, CMS management, secure login process, advanced settings, and many others. This Video Sharing script is developed in WordPress with advanced and specialized Plugin. Other advantages of our video review script are SEO optimized and Mobile responsive. The website will be compatible with all types of devices like mobile phones, desktops, laptops, and tablets. Without knowing any programming skills the admin can set-up and manage the script easily and it’s developed with advanced features, so the admin can easily upload the videos. In the admin dashboard, the admin can view all comments and pages at the glance and can take quick notes using quick draft option. The admin can also manage all the posts, media, and feedback. The main revenue for the admin is Google Ad sense, Banner advertisement, and featured listings. For this Product Video Review Script, we provide extra features such as 1-year technical support, 6 month free updates of the source code, and brand free website. After purchasing the Video Portal Script, the website will be live with the next 24 hours. We are leading Web Development Company offering various types of innovative clone scripts to the clients. This Script is amazing and they have outstanding responsive customer support. I would highly recommend this script and developer to anyone. This works perfectly! Thank you for this script! It is profitable script and I earn so much. It is all because of PHP scripts mall because they helped me so much to install the script. The developers guided me so much and made all my tasks so easy and they answered my questions very quickly and had good response. The design is also very good.